A showcase of Apalachicola's shotgun and other historic houses to raise awareness of their history, simple beauty and usefulness for the creation of affordable housing throughout the month of April 2018.
featuring paintings, photographs, birdhouses, models and more – all with the Hill’s historic houses as their motif. Exhibitors are local and national, novices and professionals. Enjoy an exhibit of rare old photographs of Holy Family School and the African-American Hill community. Last year we donated more than 40 enlarged archival photographs, this year we are adding 30 more to the collection. Open to artists of any experience and any medium. Sign up at Center for History, Culture and Art. Bring your own supplies. See more of Kate Knapp's work at www.kateknappartist.com. Presentations on issues of zoning, heir property and community land trusts, followed by a panel discussion and Q and A on the future of the Hill. Ave L between 8th and 9th Streets. Live music; bar-b-que dinners for sale. Bring your own chairs. Ministers of several local churches will lead us in a rousing outdoor church service. Hear the stories of North Port St Joe and its connection to Apalachicola. Bring Me A Book Franklin presents The Little House by Virginia Lee Burton, the story of a little house that becomes engulfed by the city that grows up around it. Come build your own house from various shapes and receive a copy of The Little House while supplies last. Meet at Holy Family Center, 7th St at Ave L, rain date Friday, April 20. Poetry must be related to Pearls. Save Our Shotguns Apalachicola is excited to present Florida Stories-Hillside as the newest tour offering for the Florida Humanities Council’s audio walking tour series. Join us for a short talk about the app and its development, refreshments, and a ceremonial download—then explore the sites and history of the Hill! A walking tour of the Hill highlighting houses and their stories with Pam Richardson. 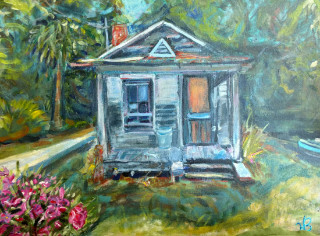 Mingle with the artists as we close out our month-long celebration of Apalachicola’s rich legacy of historic housing. We have permission from the owners of these houses for them to be on the self-guided walking tour and these owners are aware of the PEARLS’ call to artists. There are other shotguns on the Hill; for these houses, please use your own discretion and be respectful of the owners’/tenants’ privacy.